One ought not to rebel against nature it seems, nor the nature of things. A gaggle of nuns embark on a girl’s own Heart of Darkness journey into the Himalayas but ‘something in the air’ undoes the itinerant sisters one by one. Deborah Kerr leads a trio of dynamite female performances, alongside Katheen Byron as the gloriously unhinged Sister Ruth. The erstwhile pallid Jean Simmons’ debut as the village firecracker Kanchi also constitutes a major diversion. The three ladies are ranged against the mercurial Mr Dean whose past we never learn, who plays the sisters from all sides – tempter, tormenter, ally, nemesis, trickster, herald, romantic interest, he’s dancing them all – and kicks it off with one of the most ridiculous entrances in all cinema. 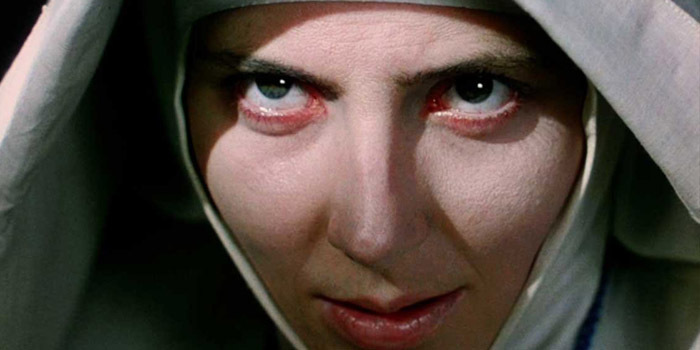 A resolution of Black Narcissus‘ themes is foregone in the drama of a random psychotic break, ending as a horror flick in all but name, and that is it’s only flaw. Poor, damned Ruth is reduced to homicidal maniac-hood but nevertheless crazies her way into our hearts forever. You wouldn’t want to get up close, but from a distance she’s an authentic fascination.